Almonds are often cited for their rich unsaturated fat content, but that's not the only nutrient these nuts provide. In addition to being fat- and calorie-dense, almonds provide nutrients such as fiber and protein. With protein come amino acids such as L-arginine that have a variety of health benefits ranging from addressing erectile dysfunction to athletic performance enhancement. L-arginine is one of a group of molecular building blocks of protein known as amino acids. All foods that provide protein offer some amino acids, although not all foods provide the same amino acids. Your body can make L-arginine on its own, but supplementation can be helpful. Arginine produces nitric oxide, a gas that relaxes, or widens, your blood vessels, which may make it helpful in addressing issues requiring improved blood flow, such as erectile dysfunction, clogged arteries and coronary heart disease, according to the Mayo Clinic website. L-arginine also prompts protein synthesis, or the production of protein, which can aid in muscle growth and repair. Almonds aren't the most protein-dense food--each 1 oz. serving provides 6 g--so they don't offer very high amounts of amino acids. Each 1 oz. 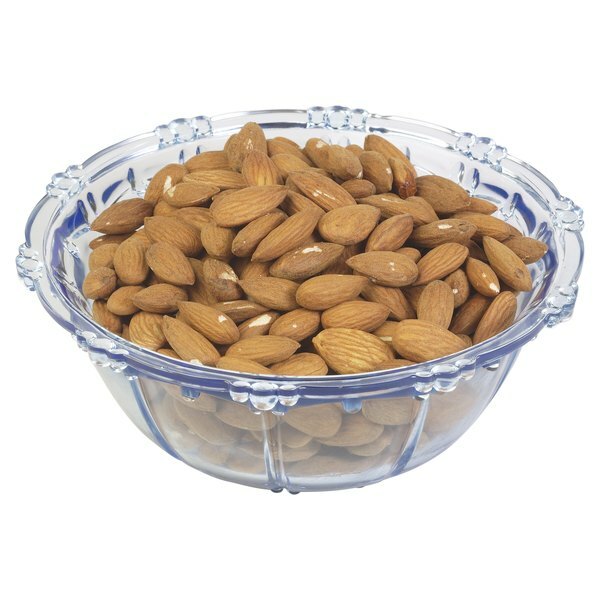 serving of amino acids provides .7 g of L-arginine, making it one of the most abundant amino acids in almonds. According to the Mayo Clinic website, daily doses of 2 to 3 g of L-arginine are standard for treating medical conditions, so you'd need to eat multiple servings of almonds or seek out other L-arginine-rich foods to reach such amounts. Almonds provide many other amino acids, and they are particularly rich in glutamic acid and aspartic acid. Glutamic acid is important because it provides glutamate, a group of neurotransmitters involved in learning and memory. Aspartic acid also acts as a neurotransmitter and, according to research from the October 2009 edition of "Reproductive Biology and Endocrinology," may help increase testosterone levels. Many L-arginine supplements are available, but you can also find the amino acid in foods other than almonds. Beef, chicken, dairy products and other protein-rich foods provide L-arginine, and other nuts such as walnuts, cashews, Brazil nuts and pecans also contain L-arginine. Talk to your doctor before taking L-arginine or any other supplements. What Foods Should I Eat If I Want to Lose 20 Pounds?